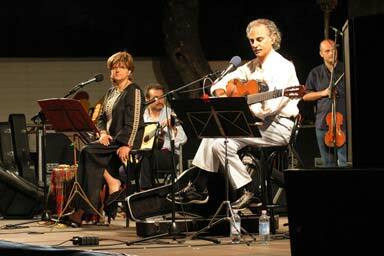 The folksingers Alfredo and Letizia Anelli were born in Palermo, Sicily, where they found their talent of nurturing the art of pure traditional music. They are singers, researchers, musicians and authors with international acclaim. In 1970, they began their studies of the history of traditional folk music, and after touring Sicily and speaking to old inhabitants from rural sicilian villages, they unearthed love songs, ballads, lullabies, devotional songs, serenades and work songs, which had laid dormant for many years. In 1972 they formed their own group dedicated to Sicilian folk music called the “ETNIC SONOS GROUP” which is made up of exceptionally talented musicians. By touring Italy and the rest of Europe the group had the opportunity to meet and play with artists renowned in their field such as Rosa Balistreri, Otello Profazio, Nuova Compagnia di Canto Popolare, Matteo Salvatore, Eugenio Bennato, Mimmo Cuticchio, Pina Bausch, Ambrogio Sparagna, and Maria Carta. They have also collaborated with many esteemed organizations such as the Ente Autonomo Teatro Massimo di Palermo, The Symphonic Orchestra of Sicily and the Theatre of Baden Baden. Over the years the “BROTHERS ANELLI “ have developed their own take on traditional methods by composing music relevant to the present, but with an essence of the past. In fact their repertoire contains elements which can be traced to varying ethnic influences such as Spanish and Greek melodies and also the Arabian - Sicilian, which have all been mixed with great talent, to open up to a new musical horizon. The brothers Anelli together with their musicians have held concerts in every part of Sicily, Italy and Europe taking part in international festivals and competitions of popular.